The one vegetable I always have in my refrigerator is broccoli. Interesting, some might say weird, but its true nevertheless!! I use broccoli in vegetables, salads, pastas, stocks, stir-fry - well you name it!! Today I tried something different with this vegetable - a warm pesto. This is pesto with a twist - it combines broccoli with spinach and pine nuts to give a nutritious and tasty alternative to regular pesto. I picked up a bunch of Dill on my weekly grocery trip with the intention of making Saibhaji. Pressed for time, I ended up ignoring the refrigerator for most of the week. On Thursday, however, I could not stop myself - the urge to whip up something quick yet delicious was overwhelming. What else, but the simple but very special Saibhaji could satisfy the taste buds!! With Thanksgiving round the corner, I am sure that everyone is drawing up a special menu for the meal that forms the centre piece of the day. While its great to have all the traditional favourites, vegetarians can sometimes face a bit of a challenge. And it can take a tremendous amount of self-education, thoughtfulness, and care if you are expecting friends who follow a vegan or gluten-free diet or are simply allergic to multiple ingredients that are a part of the treats prepared for the day. My contribution to this effort is as humble as it is simple. 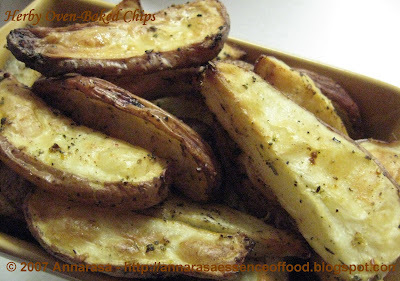 Herby oven-baked chips are one of my very favourite recipes and I hope that they would appeal to all the above diets!! Wash the potatoes and do not peel. Cut each potato in half lengthwise. Then slice each half lengthwise once again slices just under 1/2 " thick. Once all the potatoes are cut, wash once again in cold water, drain, and place in a large mixing bowl. Drizzle the olive oil on the potatoes. Next sprinkle the herbs, salt, garlic powder, and crushed black pepper. Mix well to coat the potatoes well. Place them on a cookie or jelly-roll pan. Bake at 425F in the oven for 20-25 minutes or until the slices are well cooked, and browning around the edges. This recipe goes out to Allergy Mom @ The Allergic Kid who is hosting the 'Thanks for "Nothing" Thanksgiving Roundup.